Whether you want to get away for a day or a week… whether you’ve been cross-country skiing for years or are a beginner… whether you want luxurious accommodations or something more budget-friendly… Cross-Country Ski Getaways will help you find the best destination for you! 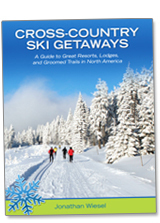 In this latest edition of his book, author Jonathan Wiesel takes you to cross-country ski areas, ranches, ski resorts, inns, B&Bs, lodges, and regional cross-country ski trails throughout the U.S. and Canada. Jonathan has spent his life skiing and involved in the cross-country ski world and, based on his visits to hundreds of Nordic ski areas over the years, he’s chosen just under 100 to be included in Cross-Country Ski Getaways. This 102-page e-book covers: trail length, level of difficulty, and grooming information; detailed descriptions of ski areas and resorts; accommodation and dining options; web site addresses; and information on other activities available (snowshoeing, dog sledding, downhill skiing, sleigh rides, and more)… all for just $9.95! To buy it, just click on the PayPal icon below and pay with a credit card. You don’t need a PayPal account, nor do you need to pay any attention to the PayPal account sign-in on the right side of the page. Simply enter the information on the left side of the page. When your payment of $9.95 is approved, click on “return to merchant” and you’ll automatically be taken to the download page. From there you’ll be able to access the e-book to print it out, read it online, or save it to read online or print in the future… whichever you'd prefer!